There I was happily sitting in Butter Beans (formerly Taylor St Baristas Richmond) this morning with my perfect Flat White and a delicious croissant, my copy of today’s Observer open on the coffee table before me; early enough to have grabbed the only sofa, close to the window so the morning sun shone through on to me. Heaven. Well, a kind of heaven. A coffee-foodie heaven. It’s Observer Food Monthly week; the Observer‘s monthly special food colour magazine full of good recipes and interviews and articles. This means before Sunday has gone far into the day, it’s an odds-on favourite for being one of the best Sundays of the month. And there was Jay Rayner talking about guilty food secrets. His included a Mr Whippy ice cream on a hot afternoon in a London park and rather dubious sounding bright red spare ribs. When he asked Hugh Fearnley-Whittingstall what his guilty food secret was, Hugh said ‘a frothy pint … and Snickers bar’. Jay thought this a bit ‘vanilla’. And I can see why. Who would be guilty about sipping a gorgeous pint of frothy ale? But perhaps the Snickers bar counts as a guilty secret. So, you’ll understand, this soon got me thinking about what my guilty secrets are – in the food department, I hastily add! And I really struggled to come up with anything truly bad. I’m not claiming any kind of foodie halo here; it’s merely that my tastes have changed over the years and while I might once have chosen a Mars bar or creamy cake, I can no longer tolerate and therefore enjoy things that are too sweet or very creamy. I used to have a sweet tooth. I come from a generation where it was considered good to give a child a slab of white bread, smothered in butter and sprinkled high with refined white granulated sugar – to give them energy. We know a bit better now. But we don’t know everything; food fads change and we suddenly learn that a very low-fat diet is bad for us after all because we need some fats; that butter is really healthier than those horrid tubs of margarine full of all kinds of additives and not a detectable natural thing in them. We can only – if we care to – take note of the current nutritional guidelines and make the best choice at the time. I used to be incredibly slim, almost skinny, until I hit my 40s, and I could eat anything without putting on a pound, which isn’t good training for eating well. I have to be more careful now (though thankfully not too careful), which is partly why my food habits have changed but more so because I do understand good nutrition now. And what I’ve found is that the less sweet, creamy or synthetic-flavoured things I eat the less I want them. I remember loving Wagon Wheels as a child: a sweet wafer biscuit with marshmallow filling and covered in milk chocolate. They were one of my very favourite things. Then I came across them – quite some time ago now – as an adult and was unable to resist buying one. I was so pleased. This would be a treat. But it wasn’t. I didn’t like it at all; it was far too sweet. I love chocolate – but only dark chocolate with at least 70% cocoa solids, definitely not milk or white – and I’m quite sure I wouldn’t like a marshmallow nowadays. I used to be a big dessert person. In the days of lots of dinner parties in my life I’d often make two or even three desserts. Now I wouldn’t and when I do it tends to be something like a fruit flan or a dark rich chocolate cake – a Torta Caprese or Sachertorte – and it definitely wouldn’t have cream layered inside it. I like a good pannacotta or tiramisu but I’m not good with syrups, toffee, fudge or sweet caramels (though a bit of salted caramel is pretty good); I don’t like the craze for making puddings or ice cream from sweet bars or Nutella. But if I have guilty foodie pleasures, I guess it would be having a dessert at the end of a good meal not because I was still hungry, but through plain greed. I do find it hard to go out for a meal somewhere special and not have dessert. If the rest of the meal has been good, I just have to see how good their desserts are. Even if I’m feeling quite full enough already. 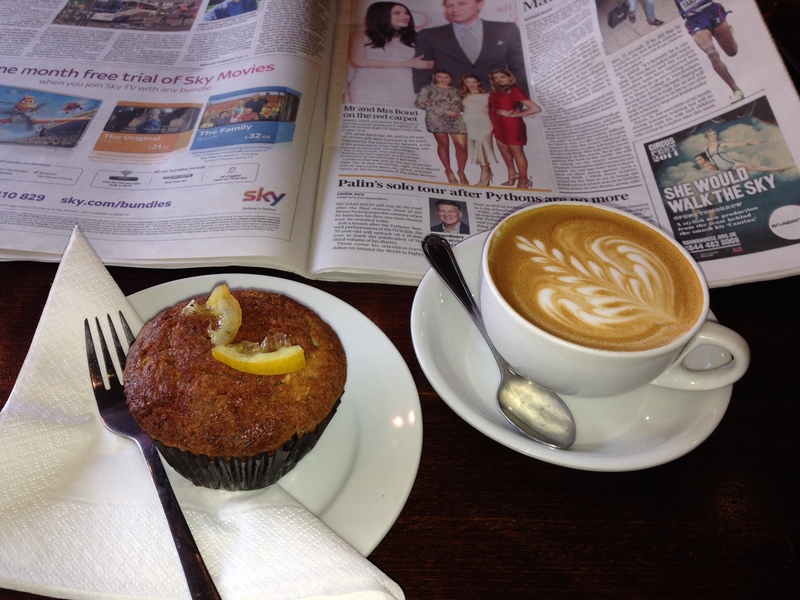 A guilty pleasure is going into Butter Beans midweek and seeing they’ve made some irresistible little lemon & poppy seed muffins (as in the photo above) and indulging; it’s going into New Row Coffee (my favourite cafe in Covent Garden) and having to have a slice of their wonderful mandarin & chocolate cake with my coffee. Even though I don’t really need it. I wasn’t brought up to be guilty about food and so I rarely am. Yes there was the sugared bread problem, but it wasn’t a regular thing and my parents indulged us in quite sophisticated treats: driving into Soho every Saturday morning to enjoy coffee and cakes at Madame Bertaux in Greek Street, London’s oldest patisserie, established in 1871. It would be heading to an Italian deli round the corner afterwards to buy gooey Gorgonzola cheese and fantastic bread that in those days you wouldn’t have found anywhere else in London, let alone outside the capital. It would be a birthday treat at Wheeler’s in Old Compton Street and eating oysters or Sole Meuniere. It wasn’t that we had loads of money; we didn’t. But food was always the thing; spare cash went on eating well. There was no promise of sweets for being well behaved, but food was a celebration of being together and enjoying good food. OK. So I really really must have a proper guilty food secret. I have to have chocolate in the house: but dark Montezuma’s or a real treat would be a box of Neuhaus praline selection or the lovely Sprungli truffles A has brought from Zurich. I have an addiction to tarallis – little round breadsticks from Puglia; so much so it’s become a standing joke with a local Italian deli, Corto, that I go in so often to buy them. I love good bread and find it hard to stop at one slice – especially Ruben’s Bakehouse‘s sourdough; I probably too often indulge in a croissant with my morning coffee, even though I’ve already had cereal. I enjoy a glass of wine most evenings and will occasionally indulge in a dram of single malt. I simply love champagne and there really is no other fizz that’s quite like it. I have a passion for good ice cream and when in Italy will visit a gelateria at least once a day. But none of those things are bad; none of them are things to feel guilty about. Just a bit of greediness from time to time; having a bit more than I need just because I can. But I’ll think on. I imagine as soon as I’ve posted this I’ll find myself reaching out for something bad and think, Oh yes!! I forgot about that. Or my children will remind me; you can always count on children (even grown-up ones) to remind you of that failing you forgot about. But you know, a few guilty secrets is no bad thing at all really: la dolce vita; carpe diem, etc. You’ve got me thinking now too. I’d have to say butter tarts. Love them with a hot coffee in the late afternoon. Pastry and sugar – that has to qualify for a bit of guilt doesn’t it? We don’t have butter tarts in UK but I googled and they look pretty amazing! I think we all deserve a treat from time to time.